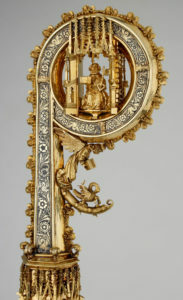 Richard Fox’s silver-gilt and enamel crozier [London, c. 1501]. Corpus Christi College, Oxford. There’s an unusual connection between Shakespeare’s plays and the exhibition that’s currently on view at the Folger: the pelican. If you search for the word “pelican” in Shakespeare’s plays, you come across three instances, in Hamlet, King Lear, and Richard II. All three refer to a symbolic meaning of the pelican that can feel remote to today’s reader or playgoer, but which Shakespeare’s audience would have found more familiar. “The Pelican was believed to revive its dead chicks by spilling its own blood for them: an obvious allusion to the belief that Christ willingly shed his own blood to save mankind,” says Peter Kidd, the curator of 500 Years of Treasures from Oxford, on view at the Folger through April 30. One of the items in the exhibition (shown here) incorporates the pelican: the crozier of Richard Fox, powerful Bishop of Winchester, adviser to Henry VII and Henry VIII, and the founder of Corpus Christi College in 1517. Let’s look at how Shakespeare’s characters poetically leverage the pelican’s symbolic meaning. For that I was his father Edward’s son! The arrangement of the pelican with its chicks has been called “the pelican in her piety.” This detail shot shows the pelican on Fox’s bishop’s staff. “The Eucharist, or Mass, was the central part of medieval liturgy, and it is therefore not surprising that, as a bishop, Fox should choose to call his new college ‘Corpus Christi’ — Latin for ‘the Body of Christ’ — and that he chose the Pelican as his personal emblem,” says Kidd.